Last Sunday was sunny and mild and for a November already in its second week heading towards winter, the kind of bonus day those who lived in the Rockaways would love go for a walk, run or ride on the boardwalk that stretched from Belle Harbor to Far Rockaway. But Hurricane Sandy put a stop to that on Halloween eve as the storm surge that united the Atlantic Ocean with Jamaica Bay for the first time that anyone could remember tore asunder the entire seven mile boardwalk, moving entire sections of it inland a block or two along with sand dunes as far as Rockaway Boulevard. The damage caused by the deluge and the resultant power outages still afflicting the peninsula because of an ill-prepared, overwhelmed or inept utility called LIPA (Long Island Power Authority) gave it the appearance and the reality of an instant warzone. The Rockaways, traumatized by 9/11 with so many victims who never came home and a subsequent tragedy a month later when a jumbo jet fell from the sky onto Belle Harbor streets and homes after a take off from nearby Kennedy Airport, and now Hurricane Sandy, tested the resilience and the resolve of the New York Irish American community once again. The latest setback was the most challenging, but it was clear to me that the huge community spirit that is ingrained with those islanders and many who feel part of it was an equal force to that combination of wind and sea that struck that night. My earliest years were enjoyable summers in Rockaway Park in a modest bungalow on Beach 105th Street rented by my Irish-born parents Martin Keating and Mary Murray. Both had emigrated from Co. Clare just before the Great Depression and were introduced to one another in the Irish social scene that was Rockaway. On that same boardwalk they would have danced Clare sets on occasion and met so many Irish people on a summer’s evening, you would swear that it connected all the way back to the Old Country. And in a symbolic way it did because the Atlantic Ocean connected Ireland and New York City. Part of the orientation to the hustle and bustle of New York City was to take the train or bus out to the Rockaways for the sea breezes and relief from the stifling heat of the city. Long before the Internet, the boardwalk in the Rockaways was a social network along with the many Irish bars and dance halls along the Boulevard. Ours was one of thousands of similar stories, and even though we were fair-haired and light skinned, the beach was our carefree oasis reachable by the A train which could take us back and forth to Washington Heights. 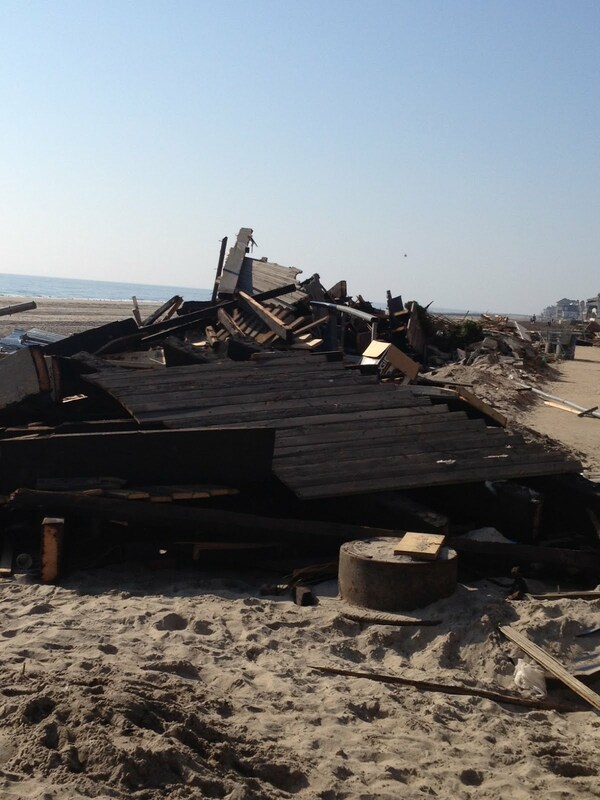 So I knew I had to get involved with helping people recover from Sandy. I have made two trips down with the New York Irish Center, which along with the Aisling Irish Center has sent volunteers to help along with many donations from the community at large. There is a massive road ahead if the entire Rockaway Peninsula is to be restored, and from the volunteer forces that I have witnessed there along with the constant presence of the New York City workers in police, fire and sanitation, it will keep moving forward. There is the opportunity to build up the Rockaway Peninsula even better than it was before, though it will take an incredible amount of resources and coordination from the public sector working with the private sector. While they are at it they can address the very peculiar municipal neglect for decades that hampered the Rockaways from becoming the spectacular beachfront community it should have been considering its geography within New York City. What I saw at work in the Rockaways in the past week was the real “Citizens United” movement of volunteers who didn’t need a whistle to call them into action, but simply a high regard for those who were in need no matter what their station or name. I have no doubt that the Irish will lead the charge there because the Rockaways have been such an important part of Irish America and New York City. And the boardwalk will be rebuilt so once again we can enjoys the sea breeze and calming walks and look out over the Atlantic towards the Emerald Isle.